First, these gender differences are at least partially genetic in origin, and they cannot be eliminated without coercion. And, of course, the usual suspects (all delusional, tenured PhD's) are proposing rigid quota systems to redress imbalances. Second, there is substantial over production in all STEM fields, and many STEM graduates never work in the discipline they studied. So, increasing the number of women actually practicing a STEM discipline requires a reduction in the number of men in that discipline. Note I said number, not percentage. Then there is the huge H-1B visa overhang. Right now, a large majority of graduate students in STEM fields are foreigners, mostly Chinese. The majority reaches 75% in many research universities. Under current law, the foreign students must go home (after a brief stay for practical experience), but under the proposed amendments all of them could stay. If enacted, the propsed amendments would crush STEM salaries and lead to a large percentage of STEM graduates being unemployed. This is, of course, the exact purpose of the amendment--to create a marxian labor surplus that can be exploited. The future of STEM graduates does not look promising. One hopeful sign is the reduction in the number of 18 year olds. This should result in a reduction in the number of STEM students and graduates, which might offset the pressures that tend to reduce STEM incomes. 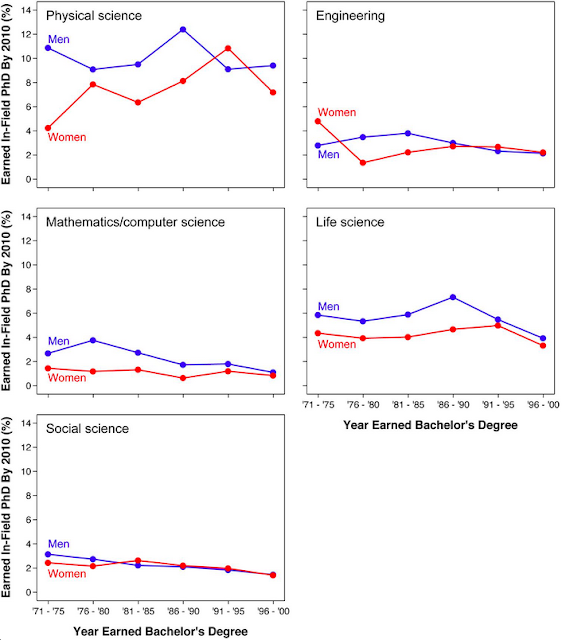 As and addendum, the concerns over gender imbalance in STEM is really part of the vicious anti-male bigotry that has infected our schools and univerisities. Drugging school boys into insensibility with Ritalin, verbally attacking men, especially white men, in college classes and discriminating against them in every conceivable way. Why any man, again especially white but really any, would want to go to college under the present abusive regimes is a mystery. A man can earn a reasonable living as a pipefitter/plumber, electrician, carpenter or construction worker, and he will not have any accumulated debt and will not have run a gauntlet of abuse to get to his job. The bright side for the gender nazis is that if they become abusive enough the gender imbalance problem will disappear along with the male students. And the remaining men will be gamma pussies. Even better. Calm down. Parents are feeding their kids Ritalin, not the schools. So if it is a conspiracy to keep white men down, it is being done by their (presumably) white parents. And last college class I attended, I didn't see anybody verbally attacking anyone. I wonder to what degree the female numbers are propped up by affirmative action. I suspect most STEM departments are under pressure to increase their numbers of female grad students and professors. Steve, you probably have some insight into this. As a woman in STEM (mostly T) I'm not going to leak anywhere with this economy considering my salary and benefits. Plus this economy has likely pushed up the ages women in my generation will have children. Though my sister who is S I think is more likely to leave the field since it seems like there is an oversupply of biological sciences graduates and not a ton of good jobs.